In gastrointestinal bleeding, red blood cells are digested, decomposed and destroyed, feces has blood which could not be recognized with the naked eye and under the microscope, so called FOB. 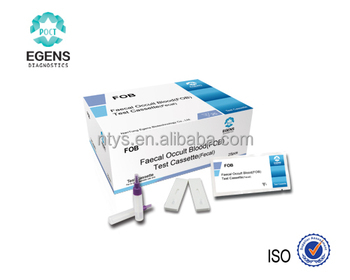 Colorectal cancer, colonitis, peptic ulcer and other diseases are asymptomatic in the early stage and only show FOB. The detection reagent detects hemoglobin in feces using immune colloidal gold technology and double-antibody sandwich method, showing a high accuracy in the detection of lower gastrointestinal bleeding. It is suitable for early diagnosis of gastrointestinal bleeding. The detection is free from the interference of other substances and food. 1. The sensitivity is up to 50ns/ml. 2. It is used only for the specific detection of human hemoglobin, compared with traditional chemical methods, reduces false positive results and has a high sensitivity. 3. Under special sampling designs, it shows quick and easy operation, and results are easy to be read.